What's Ankara Doing in Syria? Originally published under the title "Ankara's Next Move." After its incursion into Syria, Turkey will have to decide whether to declare "Euphrates Shield" a success or to continue seeking to destroy the Kurdish-led SDF in the face of US opposition. The Turkish incursion into the north Syrian town of Jarabulus and its environs, which began on August 24, is the latest dramatic re-shuffling of the deck in a long and agonizing conflict. But what is its deeper significance? 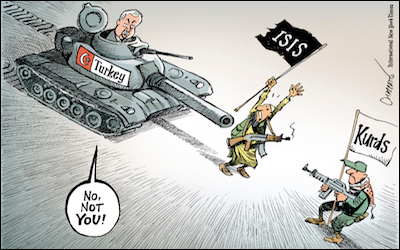 Does it represent a decisive Turkish entry into the broader effort to destroy the self-proclaimed Islamic State? Or is it, rather, the opening shot in a broader effort by Ankara to destroy the extensive gains made by Syria's Kurds and the putative federal entity they have established in the country's northeast? And what will it mean for US relations with both the Turks and the Syrian Kurds? As it currently appears, Turkey's intervention resembles previous foreign interventions into the Syrian war in the following way: It appears to have been more of an effort to stem an imminent unwanted outcome than an expression of a broader strategic plan. Turkish intervention appears intended more to avert an unwanted outcome than to realize a broader strategic plan. Much as Turkey might like to, it does not currently have either the diplomatic or military ground prepared to embark on a wholesale campaign of destruction against the Syrian Kurds. It does, however, have the power to prevent further Kurdish expansion. It appears that it has just exercised this power. What will follow will depend on whether Ankara can content itself with this limited achievement. Observe: The Turkish incursion came following the taking by the Kurdish-led, US-backed Syrian Democratic Forces (SDF) of the strategic town of Manbij. Manbij is of significance in the fight against Islamic State because it was the last exit the jihadists controlled into Turkey. Its loss is therefore an important step in securing the isolation of ISIS territory from the outside world and hence from sources of revenue and supply. Turkey, however, is less concerned about the pace of the war against ISIS. From Ankara's point of view, the taking of Manbij represented not a significant step in the war against ISIS, but rather a further advance by the Syrian Kurds, in the direction of uniting their cantons of Cezire, and Afrin along the Syrian-Turkish border, and thus achieving control of the entire long border between the two countries. Turkey is determined to stop further Syrian Kurdish advances along its border. Turkey is currently facing a renewed insurgency by the Kurdistan Workers Party (PKK) in the southeast of the country. The Syrian Kurdish YPG is closely associated with the PKK. A further advance by the SDF would mean the entirety of an international border falling into the hands of a hostile insurgent organization from a Turkish point of view. Turkey had hitherto been deterred from taking any such determined action against the Kurds because of the real possibility of Russian action against a Turkish incursion. Relations between the two countries were at a nadir following the Turkish downing of a Russian Sukhoi Su-24 bomber on November 24, 2015. Rapprochement of some kind with Moscow was thus a necessary prelude to any incursion. And rapprochement came with the meeting between Presidents Erdogan and Putin on August 9. 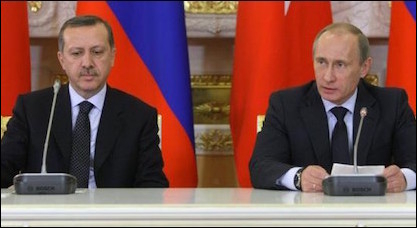 Erdogan (left) and Putin hold a joint press conference in St. Petersburg on August 9. The details and dimensions of any agreement reached between Moscow and Ankara remain unclear. The Russian media has been critical of the scale of the Turkish incursion into Jarabulus. But clearly the rebuilding of relations opened up enough diplomatic space for the Turks to dare to attempt the operation. Nevertheless, any expectation that Turkish-Russian rapprochement must involve a Turkish abandonment of the Sunni Arab rebels of northern Syria appears at least for now to have been incorrect. On the contrary, the rebels formed the main ground component in the Turkish push into Jarabulus. The US stance toward the Turkish move is perhaps most interesting of all. The Americans were apprised of an upcoming Turkish incursion. But the entry into Syria was earlier and on a larger scale than had been expected. The Americans, having supported the SDF's difficult fight for Manbij, appeared to change direction – calling for the withdrawal of Kurdish fighters to east of the Euphrates River and conditioning further US support on this action. The US supplied close air support to the Turks in the first two days of the operation. This was withdrawn once the Turks began to capture ground and villages south of Jarabulus. 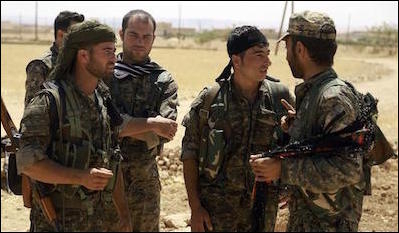 The subsequent clashes between Turkish supported rebels and the SDF constituted an indisputable case of fighting between two US client groups. The SDF is the main component in the US war against ISIS (it constitutes a "Kurdish- American juggernaut," in the words of one American analyst of Syria). The rebels used in the Jarabulus operation, meanwhile, consisted specifically of groups vetted by the CIA and receiving American support via the Military Operations Center in southern Turkey. Were the fighting to spread, therefore, this would represent a disastrous situation in which two US proxies would be firing US supplied ammunition at one another. To prevent this, the US appears to have put pressure on both sides. The Kurds, first, were clearly told that they would be left to face Turkish armor and artillery without US support if they continued to push west. But US Defense Secretary Ash Carter on Monday noted that Washington also called on Turkey to "stay focused on the fight against ISIL and not engage Syrian Defense Forces." Carter called on the Turks to keep their forces north and west of Jarabulus. As of now, a tentative cease fire has been announced by the US between the Turks and the SDF-supported Jarabulus Military Council. It is not clear if this will hold, or indeed even if it exists. Turkish officials denied that any such truce has been agreed. SDF fighters on the outskirts of Manbij, June 10, 2016. Much now depends on Turkish intentions. The Kurds and their allies expended much blood and effort in taking Manbij from Islamic State. It is beyond doubt that they will fight to defend it should the Turks and their Syrian rebel allies seek to conquer it. At the same time, if the Turkish intention is merely to prevent Kurdish efforts to push further west, toward Jarabulus and al-Bab and thence toward uniting the cantons, it is likely that for now at least a further deterioration can be avoided. US inconsistency left many Kurds furious. But the SDF is too successful an alliance to be entirely abandoned. Turkey would undoubtedly prefer a situation in which the rebel fighters under its sponsorship were chosen by the US as a replacement in the war against ISIS. This appears unlikely, however. 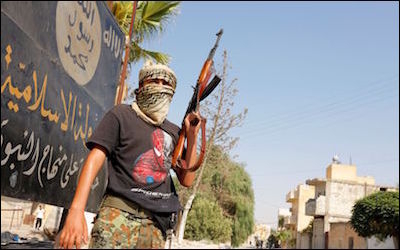 The forces aligned with Turkey consist mainly of Islamist organizations, including hard-line Salafi jihadist groups ideologically close to al-Qaida. Gen. Joseph Votel, head of US Central Command on Wednesday confirmed continued US support for the SDF. It is now Turkey's decision whether to declare Operation Euphrates Shield a success or to continue to seek to destroy the SDF, even in the face of US opposition, and with the presence of 300 US special forces personnel deployed with the SDF. Perhaps the Turks will conclude that the Obama administration's record in defending its allies so far suggests that its objections can be brushed aside. This would not be an entirely groundless assumption. But if Turkey acts on it, it will open a new and very costly front in its war against the Kurds. As of now, Ankara looks most likely to follow a more cautious path.